Pauline Baird Jones is the award-winning author of thirteen novels of science fiction romance, action-adventure, suspense, romantic suspense and comedy-mystery. GIRL GONE NOVA and OUT OF TIME were EPIC Book Award winners. Her eighth novel, THE KEY won an Independent Book Award Bronze Medal (IPPY) for 2008 and is a 2007 Dream Realm Awards Winner. Pauline has also garnered the SFR Galaxy Express Award for Best Sidekick and Best Recursion, 2013. Pauline has been at the forefront of e-publishing and the writing business. Pauline received the eBook Excellence Award in December 2000, awarded to those who strive for excellence in the e-publishing industry, and an ePub Ambassador Award in 1999. She also won a Fire To Fly award in 1998 for an article she co-wrote on electronic publishing for Futures Magazine. RK: Can you tell us the journey of your first published piece? I’d been struggling to make the shift from short fiction to novels and this idea, well, it removed the struggle. All the switches in my brain moved to ON position. Five hundred pages later, I typed “The End” and looked blearily around, wondering what to do next. Luckily I found RWA and launched myself into the publishing learning curve. Yeah, it was a pretty painful ride back then. But despite doing almost everything “wrong,” that book—Pig in a Park, renamed The Spy Who Kissed Me—went on to be nominated for some awards and is still available for sale. RK: Can you remember some of the books that made you fall in love with reading? RK: You have a wonderful SFR series: Project Universe. (The Key, Girl Gone Nova, Tangled in Time, Steamrolled, Kicking Ashe) How did you develop the Project Universe world? What fuels your creativity? PAULINE: Project Enterprise is my accidental series. I wrote what I thought was an action/adventure novel that just happened to take place in another galaxy and turned out to be space opera. Readers loved it and asked for more. It won some acclaim (I love acclaim since money was a bit short initially LOL), so I started thinking, “What could happen next?” And before I knew what hit me, Doc strolled onto the stage, exchanged sultry looks with Hel (my semi-bad guy from The Key) and Story Happened. I thought—again—okay, now I’m done. But a friend pointed out that I wasn’t done. There was still a Really Bad Guy out there that needed to be dealt with. So I wrote a novella, a couple of novels and a couple of short stories and finished it. And the Really Bad Guy. Cause he deserved to get finished. RK: Do you have a set writing routine? RK: Can you tell us a little about your latest release? Any upcoming releases? PAULINE: My latest SFR release is Kicking Ashe. When I finished Steamrolled, I kind of left Ashe with her tush hanging out, somewhere and some when. I also had another semi-bad guy who needed redeeming, so I tossed them together and crap started to happen. When I started it, I thought it would be another novella (like Tangled in Time), but Time had lots of Ashe kicking to do before it was satisfied that she deserved her happy ending. 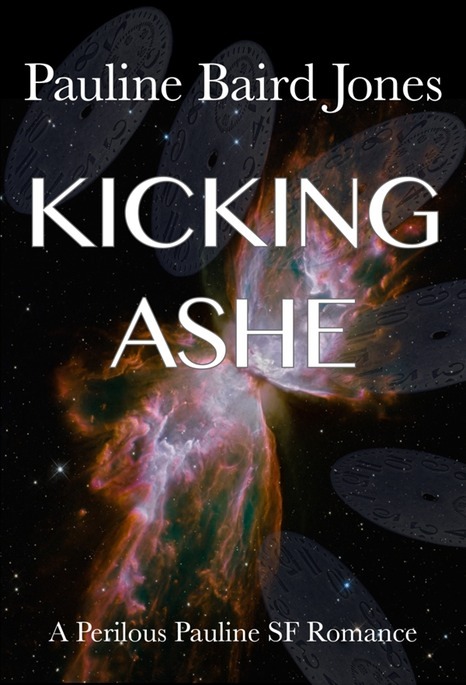 On the upside, Kicking Ashe was not another BAB (big a** book, like The Key, Girl Gone Nova and Steamrolled). My next release is (tentative title) Dead Spaces. This will be a new series, set in New Orleans in the future, well, it is planned to be part of my Big Uneasy series but for my SFR fans. I don’t want to say too much, because that tends to kill my Muse. But I’m excited about the book. J It probably won’t release until next year. My hope is for early next year, however. RK: With all of the changes in the publishing world, do you have any predictions about the road ahead for writers and readers? PAULINE: I think it is a wonderful time to be an author and a reader. So many books that weren’t considered marketable by New York can now be brought directly to readers who love niche books, such as science fiction romance. For instance, seven years ago, my then agent told me I needed to focus on romantic suspense. Had I done that I wouldn’t have written my Project Enterprise series or Out of Time (my time travel). Three of those books have won awards and all are currently selling well (when my publisher closed this year, I made the decision to go all indie with my books). While I like the selling part, what I LOVE is that readers are still finding these books. RK: What mythical creature would you like as a pet? Why? Follow Pauline at her site, on Facebook, Twitter, and Pinterest. When you save Time’s tush—or its version of one—it ought to cut you a break, not kick your tush some where and some when. Though boo yah on providing a hot guy in leather to pull that tush out of the impact crater that Ashe so did not make despite the somewhat damning evidence to the contrary. And, oh yeah, some really strange meteorites are making landfall in some very strange ways. Seems Time has a new hobby: kicking Ashe (and shame on It for doing it when she’s down). Not that she plans to stay down. Or give up the guy. I loved your answers! The last made me laugh. Olivia from TANGLED IN TIME is my favorite steampunk romance heroine. She’s oh-so-proper, smart, and cute! Thanks for your art!